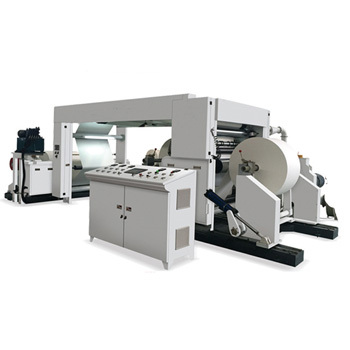 Slitting and rewinding machines of high versatility and heavy duty applications for a wide range of flexible packaging materials,various plastic films and laminates as well as paper. The main feature of HTFQ-C series is the bridge overhead path,which is suitable for cleanliness purposes,easy web doctoring and finished roll unloading on moving trolleys as well as the high grade of automation possibility. 1. With PLC control system and Touch Panel HMI to preset working parameters,easy operation. 2. With 3 sets Frequency Inverter as main motor,one is for feeding and others are for rewinding tension control,which is implanted into PLC,easy operation. 3. With Hydraulic Shaftless/Pneumatic Shaft Loading System for heavy jumbo roll loading,save labor. 4. With Pneumatic Brake for unwind tension control. 5. With EPC web guide for material edge tracking,especially for printing material. 6. With disc type blade/razor type blade for material cutting. 7. With meter counter and emergency stop. 8. All transmission roller have been dynamic/static balanced treatment. 9. Electrical applications are strictly in accorandance with CE certification.